Komodo dragons originated in Australia, where they have lived for four million years, but are now also found on the Indonesian island Komodo. They can reach up to 3 metres in length and about 70 kilograms in weight. They are so big because there are no other carnivores that live on the island with them. This gives the dragons first pick of all the food on the island! The large size becomes a trait that is passed down to their offspring, a phenomenon known as island gigantism. The komodo’s tail is as long as its body and it has a long forked tongue. Its skin is covered in strong armoured scales that acts like chain-mail armour. 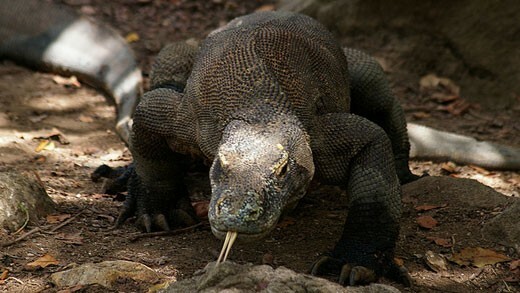 The komodo dragon has poor eyesight and restricted hearing ability. However, it can use its tongue to detect smells and taste. The komodo dragon sticks out its tongue and swings its head from side to side when it moves. This allows it to find prey up to 6 miles away! Komodo dragons like to live in hot and dry places and are ectotherms. Ectotherms are animals that use the sun as a way to heat themselves up. This also means that they are mainly active in the daytime. Komodo dragons are carnivorous but also like to scavenge carrion (dead animals). They produce venom which can cause its prey to lower its blood pressure, mass bleeding and induce shock. This helps them take down large animals such a deer and water buffalo. For many decades people believed that it was the bacteria in the dragon’s mouth that caused its prey to die by infection. In fact, Komodo dragons have very clean mouths! They have been known to lick around their teeth and mouth as well as rub their face among leaves after eating. Komodo dragons are a vulnerable species. The main pressures on their population are habitat loss and loss of prey due to poaching.